Shelley is a Redguard rogue residing in Cheydinhal, where she helps out at the fashionable Cheydinhal Bridge Inn. Shelley works mainly during the evening hours and spends her spare time outside the inn. Her bed is located in the locked basement underneath the inn, and she sleeps there every night between midnight and 6am. After waking up, she heads up to the second floor where she will spend two hours preparing the place for the day. 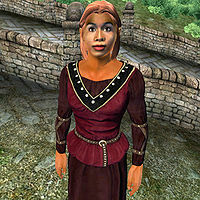 At 8am, she leaves and heads for the Chapel of Arkay, where she receives a blessing from Stendarr. After sitting on a pew for four hours, and if the weather's dry, she’ll take a stroll to the grassy area behind Borba's Goods and Stores and find her favorite spot right next to the path leading to the castle. At 5pm, she heads back to the inn and her duties on the second floor until she eats a late dinner between 9pm and 11pm. After an hour of walking sleepily around, she heads back to the basement at midnight. On rainy days, she will, after her visit to the Chapel, head straight back to the inn. To meet the Cheydinhal Bridge Inn’s standards, Shelley has invested in a set of middle-class clothing, a burgundy linen shirt with matching linens and a pair of quilted shoes. She only carries a decent amount of gold. Shelley doesn’t own the double bed in which she sleeps, so it’s perfectly alright for the player to sleep next to her. Esta página foi modificada pela última vez à(s) 19h13min de 2 de abril de 2013.